As a result of the recent Ebola outbreak, healthcare execs across the country and around the globe have been reevaluating the recording of their hospitals’ staff, patient and visitor interactions. Supporting and improving infection prevention best practices, as per the Centers for Disease Control (CDC), is imperative to both a healthcare facility’s own safety but also general public health. 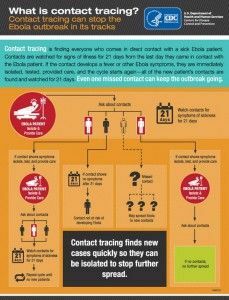 Although the contact tracing process is effective, many facilities are seeking a more pro-active approach to managing infectious disease control. Real-time location systems (RTLS) offer a means to automate the tracking of relevant data sets related to clinical interactions and outcomes. So, how exactly can RTLS help to prevent and control the spread of infectious diseases? Hospitals which deploy real-time location systems (RTLS) are able to automate many of these processes. For example, RTLS, or indoor- tracking technologies can connect caregivers to patients, visitors and equipment. By monitoring location and status of all people and assets, hospitals can have visibility to the associations and between each group (patient-staff, patient-equipment, etc.) and have data available to confirm interactions at any given time and place. – Isolate and contain affected parties to prevent the transmission of infectious agents. – Capture clinical milestones, automate contact tracing, data collection and reporting. Because this solution eliminates the need for manual reporting, decision makers have accurate location data to work from and a leg-up on their competition— the outbreak. An RTLS system can track (with active-RFID tags) the location and interactions among people, objects, and their surroundings in real-time. Oftentimes, reporting during these critical times is dependent on manual data collection/recording. In these time-sensitive situations, healthcare executives must make every moment count when assembling risk management teams and the processes associated with the gathering of information and data around critical patient-staff interactions.